Alpha Source, Inc., a Milwaukee-based medical replacement parts distributor and battery-pack manufacturer, had a successful Earth Day cleanup of Calumet Road and the area surrounding the Calumet Woods Business Park. The event was held on Friday, April 20th, 2012 from 11am-2pm. This was the third year Alpha Source hosted the event. 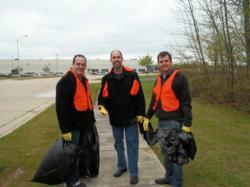 Employees from Visual Impressions and Douglas Dynamics, LLC joined Alpha Source employees in the cleanup. Project Calumet is a chance for all the businesses in the Calumet Woods Business Park to come together. Alpha Source, Inc., a Wisconsin-based medical parts distributor and battery-pack manufacturer, had another successful Earth Day cleanup of Calumet Road and the area surrounding the Calumet Woods Business Park. The event, called Project Calumet, was held on Friday, April 20th, 2012 from 11am-2pm. Alpha Source employees and employees from the surrounding businesses participated in this year’s cleanup. This is the third year Alpha Source has hosted Project Calumet. This year’s event brought over 40 volunteers including employees from Alpha Source, Visual Impressions and Douglas Dynamics, LLC. Volunteers picked up litter and trash along West Calumet Road, in the wooded areas surrounding the Calumet Woods Business Park, and neighboring side streets. Over 60 bags of litter and trash, along with various large scrap items, were collected. Generous donations and discounts were also provided by Starbucks and Cousins near Good Hope Road and 76th. Alpha Source, Inc., a Wisconsin-based medical parts distributor and manufacturer, is a global supplier specializing in illumination and batteries for the healthcare industry. Established in 1986, Alpha Source is an ISO13485:2003 battery pack manufacturer with an emphasis on products used in medical and technical applications. Alpha Source distributes a variety of products including medical lamps, batteries, monitoring accessories, fiber optics, O2 sensors, power protection products, diagnostic Instruments and supplies, and mounting solutions. For a complete list of products or for more information on Alpha Source, visit http://www.alphasource.com or call 800.654.9845.